on CJSF 90.1FM Wednesday 12-1pm. The Blurred Crusade (the best in punk & post-punk) w/ your host Todd McCluskie. Lo-fi, DIY and home recorded music. on CJSF 90.1FM Friday 1-2pm. Classic jazz, blues, world, and acid jazz. on CJSF 90.1FM Tuesday 4-6am and Wednesday 12-2am. CanCon friendly ... award-winning weekly syndicated radio show on-air since 2004. A weekly blend of the latest releases from musicians out in the clubs today, classic jazz tracks, blues, world, and acid jazz. on CJSF 90.1FM Friday 1-2am. This is a radio program with music meant for night listening. Imagine a late night drive, and an anonymous voice brings you dark melancholic songs. A special blend of roots music. on CJSF 90.1FM Friday 12-1pm. Roots and Berries features a special blend of fiddle and banjo music and the odd tidbit of information that may have you asking, "Is it fruit, a berry or simply a juicy little nugget?" on CJSF 90.1FM Saturday 12:30-5am. 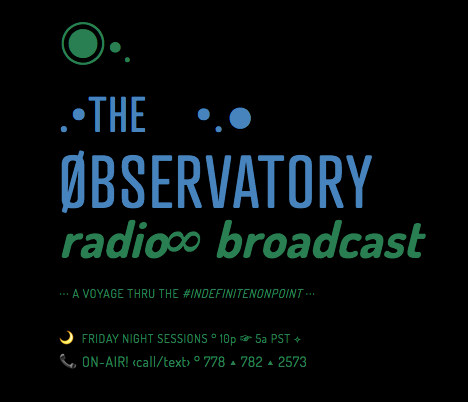 WELCOME TO THE ØBSERVATORY... AFTERHOURS BROADCAST ! COME ØBSERVE WITH US ! "øbserve there is no øbserver, øbserve there is no sound, øbserve there are no voices, streaming from no cloud. øbserve there is no this, øbserving this, here now. øbserve there is no self, appearing as the TA☯. øbservant servants of no mind, no ego to reflect... the music happens by itself, both artist and the sesh. no cosmic rush of feels and squeals, expressing all that be... ever came and ever left, the lone øbserving 'me'. si, myself & i agree to freestyle thru the night... the intelligence of everything, will dance my freedom right. i am alive. or am i....?" A weekly one-hour music program focused on strange, experimental and independent Canadian rock and pop. Produced live at CFUV 101.9 FM.